Recent achievements in each departments/laboratories are as follows. Conventional semiconductor switching device is hard to generate fast rising pulse high voltage directly such as an excimer laser exciter. In this study, we have used a new generation power switching semiconductor device as Silicon-Carbide based Metal Oxide Semiconductor Field Effect Transistor (SiC-MOSFET) for primary switching circuit. Primary switching module are using 6 parallel discrete SiC-MOSFETs per unit. Maximum switching voltage and current of the module is 1200V and 1500A respectively. We have developed multi connecting modules. And we have succeeded to multi parallel synchronized switching of modules. 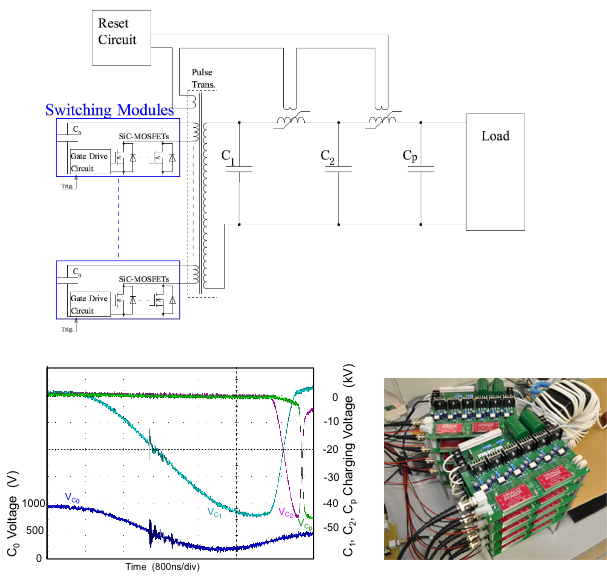 A pulsed power modulator consist of multi parallel modules, pulse transformer and 2 stage magnetic pulse compression (MPC) circuit. And we have obtained output voltage of 50kV with 90 ns rise time. 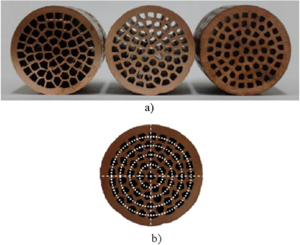 The paper presents the first extensive research on microstructural and mechanical properties of a novel porous copper structure with unidirectional longitudinal pores (UniPore) structure. The unique fabrication method is based on explosive compaction of copper pipes. The high pressure achieved by explosive detonation during compaction causes explosive welding between the pipe surfaces resulting in a regular and homogeneous cellular cross-section. The quality of bonding surfaces has been studied on transversal and longitudinal cross-sections by a metallographic analysis. The mechanical properties of three different UniPore structure porosities (between 0.32 and 0.58) have been evaluated. The anisotropy of the UniPore structure has been analyzed by compressive quasi-static test loading in transversal and longitudinal direction regarding to the pore orientation. The three-point bending tests have been performed at quasi-static and dynamic loading conditions supported by infrared thermography for visualizing the propagation of plastic regions and crack on the specimen's surface. It has been confirmed that the fabricated UniPore specimens exhibit a very low deviation of geometrical properties. Additionally, excellent compressive properties (for both loading directions) with high energy absorption capability have been observed. The three-point bending tests have demonstrated advantageous ductile failure of UniPore specimens that is more postponed at dynamic loading. UPPER: 2-dimensional analysismodel and flight process by exprosive detonation. 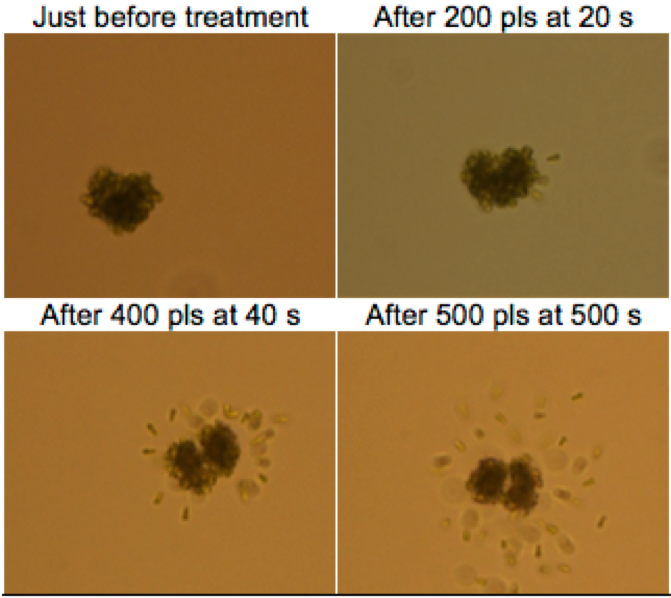 LOWER: Cross-sectional image of SUS304 plate coated by WCpowder particle. 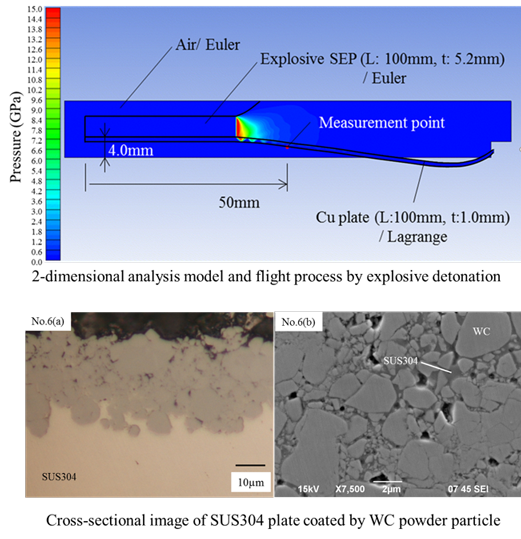 The surface properties of metal plates were improved using tungsten carbide (WC) powder via a series of experiments, which involved explosions to cause acceleration and flight of metal plates for a high-velocity collision of the metal plates with the WC powder. The flight velocities of the metal plates were calculated by numerical analysis and were consistent with the results obtained by the application of Gurney equations. The combination of fine particle of WC powder with the SUS304 plate resulted in the plastic flow of SUS304 between the WC powder particles that were compressed by impact, forming a film composed of both the materials. The improvement in the wear characteristics of the metal base material was confirmed by wear tests of the films. Selected shadowgraph images of polycarbonate impacted by a polycarbonate sphere at 6 km/s obtained in side view (a-c) and top view (e-g), simultaneously. (d) and (h) are postmortem photographs in side view and top view, respectively. To understand hypervelocity-impact-damage mechanisms is one of the important issues in the fields of planetary science and space engineering, because of relations with meteorite impact and space debris problems, and so on. We are investigating the impact damage processes and mechanisms by the high-speed visualization of the hypervelocity impact event. 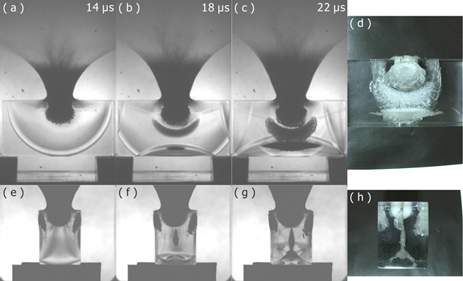 The figure shows the high-speed images of polycarbonate impacted by a polycarbonate sphere at 6 km/s taken by two-directional imaging. The series of images clearly demonstrate the internal damages are initiated by the interaction of the reflected waves from target surfaces, and suggest that the usefulness of multidimensional high-speed visualization of impact event to improve the understanding of the impact damage process. 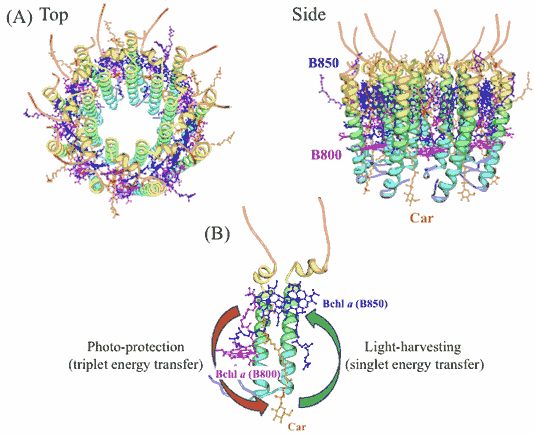 Photosynthetic light-harvesting apparatus efficiently capture sunlight and transfer the energy to reaction centers, while they safely dissipate excess energy to surrounding environments for a protection of their organisms. In this study, we performed pump-probe spectroscopic measurements with a temporal window ranging from femtosecond to sub-millisecond on the purple bacterial antenna complex LH2 from Rhodobacter sphaeroides 2.4.1 to clarify its photoprotection functions. The observed excited state dynamics in the time range from sub-nanosecond to microsecond exhibits that the triplet-triplet excitation energy transfer from bacteriochlorophyll a to carotenoid takes place with a time constant of 16.7 ns. Furthermore, ultrafast spectroscopic data suggests that a molecular assembly of bacteriochlorophyll a in LH2 efficiently suppresses a generation of triple bacteriochlorophyll a. Dependence of grain morphology and crystallographic texture on fatigue properties in commercially pure Ti sheets processed by 6 cycles of accumulative roll-bonding (ARB) were investigated. The 6-cycle specimens consisted of fine equiaxed and elongated grains parallel to the rolling direction (RD) and had a basal texture with a c-axis inclined 24 degree from the normal direction toward the transverse direction (TD) of the sheet. Constant stress amplitude testing and fatigue crack growth testing were carried out to evaluate fatigue properties of the 6-cycle specimens. Two loading directions were used in each fatigue test. Crystallographic texture strongly affected fatigue crack initiation life, which was greatly delayed in TD loading compared with RD loading. 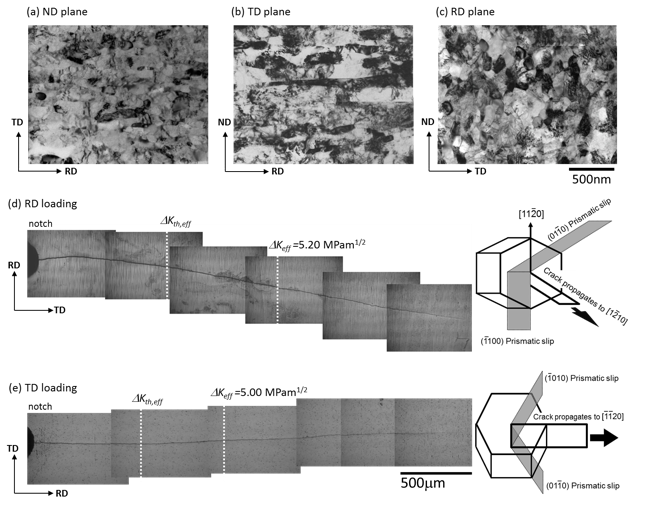 Conversely, fatigue crack propagation behavior did not depend on sheet direction due to mutual cancelation effects of the grain morphology and crystallographic texture. The semiconductor image sensor keeps developing as a core part of Kotozukuri as industrial rice indispensable for economic growth already. The subsidiary company of Sony world share No.1 will plan to reinforce the productive capacity for 10 times 10 years later. The top priority issue which will be surfaced when increasing industrial competitive power of image sensor business, 1) to overcome a problem of white bruise, 2) innovative energy-saving technique. It's being conquered by PPCM measurement from Kumamoto University about 1), and we assume that it's possible to operate mass production equipment by 20 percent of present load energy by virtual metrology way from Kumamoto University. We plan to put it into effect by grant in aid from NEDO and the input by Sony. 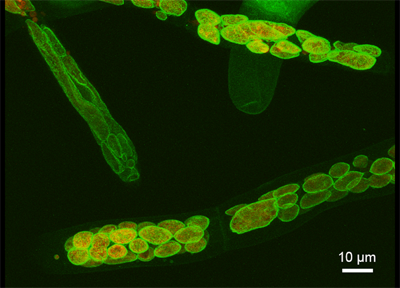 It is now widely accepted that an endosymbiotic cyanobacterium evolved into the plastids of green plants. Although free-living bacteria typically have peptidoglycan in their cell wall, it is believed that the plastids of green plants lost endosymbiotic peptidoglycan during evolution. We isolated a homolog of the bacterial peptidoglycan-synthetic gene encoding D-alanine (D-Ala):D-Ala ligase from the moss Physcomitrella patens. Generated knockout transformants showed disrupted chloroplast division and giant chloroplasts, and the phenotype was recovered by the addition of DA-DA. Using a metabolic labeling method for peptidoglycan with a DA-DA dipeptide probe and click chemistry, we visualized plastid peptidoglycan fully surrounding the chloroplasts of the moss. Our findings suggest that the plastids of basal land plants have a peptidoglycan wall containing D-amino acids. Variation of intracellular Ca2+ mobilization caused by nanoseconds and microseconds electrical pulses. Green: Ca2+, Blue: nucleus, Red: endpasmic reticulum. We are interested in variations of intracellular Ca2+ mobilization depending on pulse duration and discusses their mechanisms. 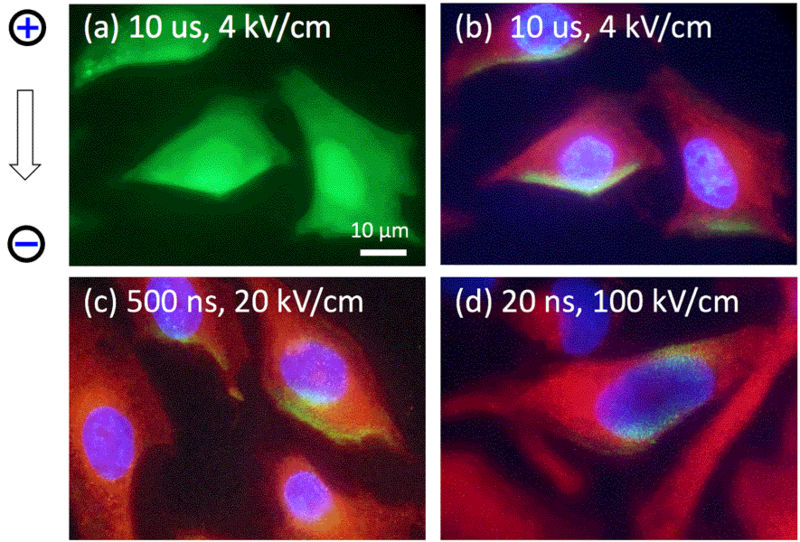 A fast microscopic fluorescent imaging system was employed to observe intracellular Ca2+ mobilization in HeLa cells subjected to pulses of three lengths and intensities: 20 ns, 100 kV/cm; 500 ns, 20 kV/cm; and 10 μs, 4 kV/cm. When the cells were exposed to a 10 μs pulse, an unexpected increase in Ca2+ concentration took place only at the negative polar site. No Ca2+ increase was detected in HeLa cells in the Ca-free buffer. Our experiment indicates that the 10 μs pulse delivers a large amount of extracellular Na+ through the plasma membrane. This violent Na+ influx inhibits Ca2+ influx from the positive site. Conversely, a 20 ns pulse causes Ca2+ emergence from the vicinity of the nucleus at both polar sites with the presence of extracellular Ca2+, whose emergence is associated with IP3R. The experiment implies that a 20 ns pulse physically activates IP3Rs with the presence of extracellular Ca2+. Interestingly, Ca2+ mobilizations observed in both 10 µs and 20 ns pulses were observed simultaneously under the 500 ns pulse. It is thus apparent that a variety of Ca2+ mobilizations can be induced using different pulse durations. UPPER: Schematic representation of protein crosslinking induced by nsPEFs. 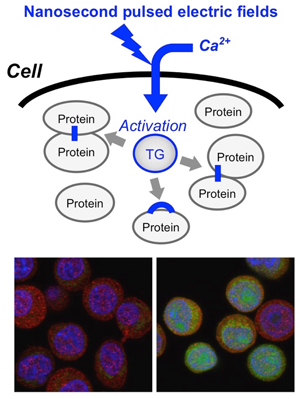 nsPEFs induce calcium influx and activation of transglutaminase (TG), leading to crosslinking of various cellular proteins. 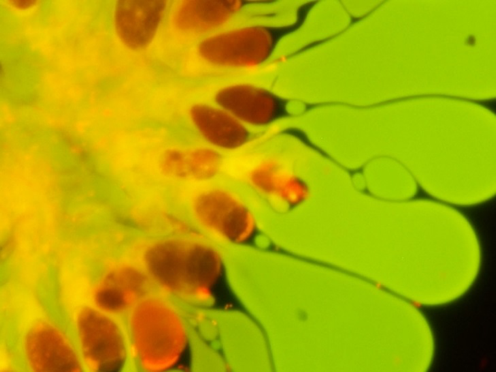 LOWER: Fluorescence microscopy of nsPEF-exposed cells. Green: crosslinked proteins, Red: Microtubules, Blue: DNA. Nanosecond pulsed electric fields (nsPEFs) are considered to be a novel therapeutic means for cancer because of their cytotoxic effect and anti-tumor action. Recently, we demonstrated that nsPEFs induce excessive protein crosslinking in cultured tumor cells. Employing experimental approaches including RNA interference, we revealed that transglutaminase 2, an enzyme catalyzing protein crosslinking, is activated by nsPEFs in a calcium-dependent manner. Excessive protein crosslinking is known to abrogate normal protein functions and to cause an exacerbation of neurodegenerative diseases, such as Alzheimer disease. Our data clearly demonstrated unique biological actions of nsPEFs, which are distinct from conventional therapeutical means. The conjunction of low intensity ultrasound and encapsulated microbubbles can alter the permeability of cell membrane, offering a promising theranostic technique for non-invasive gene/drug delivery. Despite its great potential, the biophysical mechanisms of the delivery at the cellular level remains poorly understood. Here, the first direct high-speed micro-photographic images of human lymphoma cell and microbubble interaction dynamics are provided in a completely free suspension environment. Our real-time images and theoretical analyses prove that the negative divergence side of the microbubble’s dipole microstreaming locally pulls the cell membrane, causing transient local protrusion in the cell membrane. 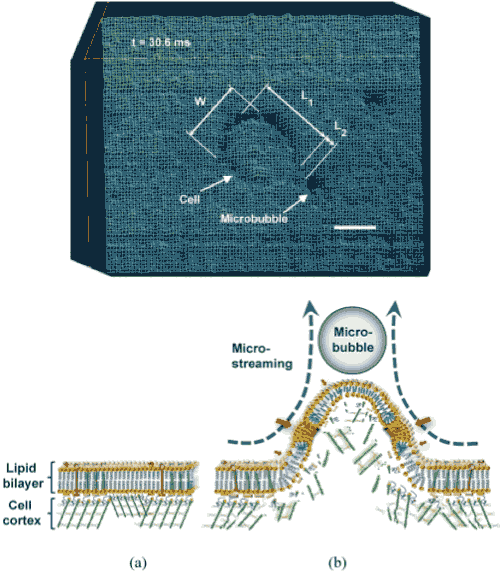 The linear oscillation of microbubble caused microstreaming and imposed shear stress on the membrane. Positive transfected cells with pEGFP-N1 confirm that the interaction causes membrane poration without cell disruption. The results show that the overstretched cell membrane causes reparable submicron pore formation, providing primary evidence of microstreaming sonoporation mechanism. Botryococcus braunii var Kuetzing observation under fluorescence microscopy. Nile red (0.15 mg/mL) is used to stain lipids (green) and periodic acid (10%) is used with propedium iodide (1 mg/mL) as Schiff reagent to stain polysaccharide (yellow and red). - Pulsed Power Generation Control Lab. - Supercritical Fluid Process Lab. - Shock-Compression and Strong-Gravity Materials Science Lab. - Condensed Matter Physics under Extreme Conditions Lab. - Extreme Material Science Lab. - Semiconductor Extreme Function Science Lab. - Shock Wave Bioelectrics Lab.